US government plans to rescue banks from billions of dollars in bad debt and the BAN on short selling in US markets for the next two weeks which further boost up our instinct for higher targets 4500 and 4800. 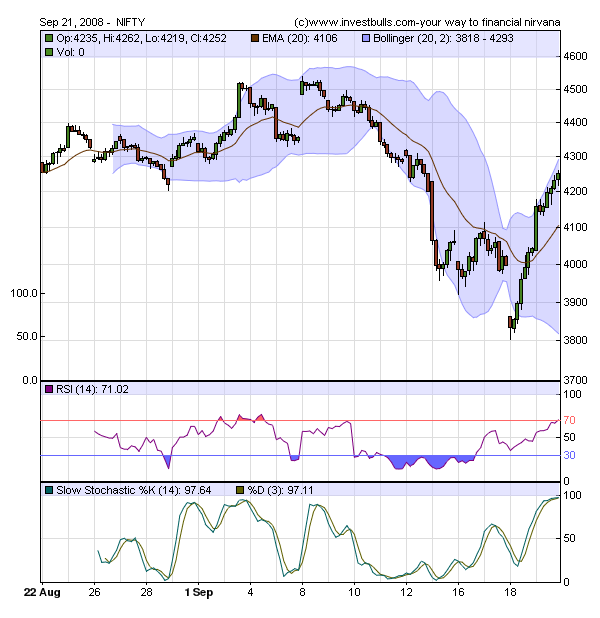 But my hourly charts shows limited upside may be extend upto 4330. Hourly Charts are like shakira's Hip… Just remember "Hips Dont Lie…!" And 4330 is the 61.8% retracement line drawn between the recent high 4625 and recent low of 3800.
return to the normal tune. Hexaware Weekly Trend Analysis – Sell Alert Hexaware on the weekly chart had broken below the trendline and a Close Below 77.50 Will Create Selling and Stock is Likely come down to 72-70 and 62-63.